Departments of roads and highways around the world have begun to implement technology solutions to improve the safety of their highways, lessen congestion and manage traffic more efficiently. 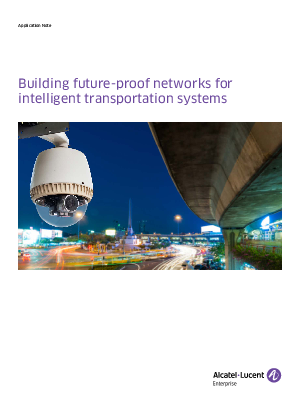 Intelligent Transport Systems (ITS), as these systems are known, require reliable, secure and scalable networks to link cameras, sensors, signage, signaling and vehicles to remote data centers and operation centers. These networks will be deployed in harsh environments and will pose their own unique challenges to operate, maintain and manage. In this application note, we will present the unique requirements of ITS networks and discuss how AlcatelLucent Enterprise products and technologies not only meet today’s ITS requirements, but are designed to grow and scale to meet tomorrow’s as well.